Malaga Airport receives in its facilities a new sample of more than 70 works of Mainoba collective. In particular, the exhibition hall of the T3 includes a selection of paintings by 28 art enthusiasts that make up the group and which have selected 72 works for this particular collection. 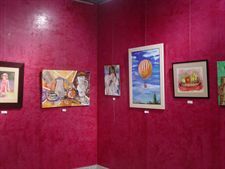 Through paintings, watercolors and pastels, Mainoba offers a journey through different painting techniques with a common denominator: a festival of color that serves as leitmotif of the exhibition and invites imagination. The selection of paintings remains in the exhibition hall of the terminal T3 in the Arrivals area, until May 31 and can be visited from 11 am to 1 pm and from 6 pm to 8 pm, as reported from Spanish Airports and Air Navigation (Aena) through a statement.